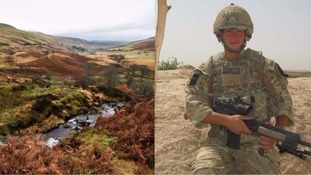 Tributes are pouring in for Catterick soldier Josh Hoole who died on a training exercise in Wales. A Ministry of Defence spokesman said the 26-year-old, who was a member of the Rifles regiment, was taking part in a basic combat fitness, which they said was a "standard minimum requirement test which everyone on the training must achieve." The spokesman said the test consisted of an eight-mile march wearing boots, carrying webbing, a burgen and rifle with a combined weight of 25kg. The march started at 7am at Dering Lines - along roads around in Brecon. The were no hills on the route. The march was two hours and after returning to Dering Lines the soldier collapsed and an ambulance was called. His grandfather, John Craig, said: "He was a beautiful grandson. "He was a dedicated soldier. He always wanted to be top dog. He was a superfit boy, he kept very fit." Corporal Hoole, who was based at the Infantry Training Centre in Catterick, and was from Ecclefechan near Lockerbie in Scotland, had done two tours of Afghanistan and been to Iraq. Mr Craig added: "He visited me regularly, every chance he got. I took a bottle of whisky to him on the 12th of July for his 26th birthday." Writing on Facebook, stepmum Carol Jeffreys said: "Rest easy soldier. "My beautiful stepson. Can't believe it. Will always love you. So very proud of you. Thoughts with your family and fiancee." Defence Minister Mike Penning also paid tribute.